Shoppers Stop collaborates with Rhea & Sonam Kapoor to launch Rheson! With the pricing starting from Rs. 499-Rs 3599, Rheson is a high street fashion brand meant for the real Indian girl. Sonam Kapoor is unquestionably India’s quintessential style icon. However, her uber chic appearances have been orchestrated and curated by a dedicated team of experts helmed by sister Rhea Kapoor. The fashion journey of the Kapoor sisters is globally discussed, locally inspired and homegrown in the truest sense. Therefore, it comes as no surprise that the sisters have decided to build a high street fashion brand that embodies their style sensibilities. ‘Rheson’, aptly named after the stylish duo, is now exclusively available at India’s leading fashion retailer Shoppers Stop. The Kapoor sisters along with Govind Shrikhande, Customer Care Associate & Managing Director, Shoppers Stop Ltd. showcased the Rheson collection at a press meet today in Mumbai. A short film on the making of the brand was also presented. ‘Rheson,’ is a combination of Rhea and Sonam, phonetically pronounced reason. With the pricing starting from Rs. 499-Rs 3599, Rheson is a high street fashion brand meant for the real Indian girl. The USP of this brand is that whilst the clothes are super fashionable - they have been curated by the most fashionable sisters in the country - they are also affordable without making any compromises on the quality as well as longevity of the garments. What’s more, Rheson will also be extremely easy to access since the brand will be exclusively available across Shoppers Stop stores in the country as well as on www.shoppersstop.com and the Shoppers Stop mobile app. 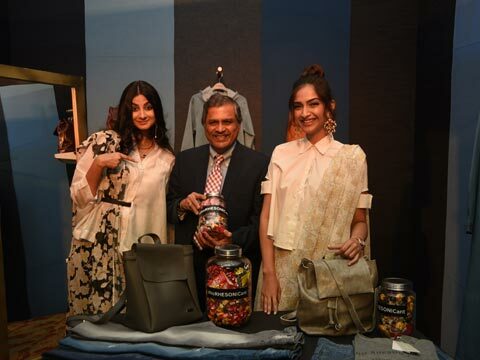 Speaking on the launch of Rheson, Rhea Kapoor states that, "Sonam and I wanted to create a brand keeping the Indian girl and her sensibilities in mind. It was also essential for us to have control over the quality, pricing and styles and provide attention to detail, which we have done. Since we are the customer, it was easy to cater to the customer. We have a strong understanding of what girls want. According to me, glamor should be accessible to you, no matter who you are. People want to wear clothes that are comfortable and stylish in nature, a combination that is hard to find. Rheson has been created keeping the Indian customer in mind, her body type as well as what she likes to wear to office, with her friends, for festive occasions, for glam night outs, there is something for every girl. Furthermore, our brand is priced in an extremely competitive fashion so that no girl has to think twice before embracing her stylish side"
Rheson will make its fashionable debut with two main themes – Inspiration from the Nostalgic 90s and the Mogra collection. The Nostalgic 90s collection will immediately take you back to your childhood with elements such as sweet cigarettes, pop candy, stationery and retro influence taking centre-stage on t-shirts, cropped tops, button-down dresses, denim jackets and more. The Mogra collection is a chic and young indo-western collection inspired by the fragrant mogras. Monochrome prints inspired by the buds of the mogra add a soothing and refreshing touch to summer. The range has fun silhouettes such as palazzo saris and floral dresses that can be mixed and matched to create #insta-fresh DIY looks for special occasions.